A new vaccine against dengue was licensed for the first time in December of last year and is now in the market in five countries in the world, namely Mexico, Brazil, El Salvador, Costa Rica and The Philippines. Nevertheless, the shots against the virus will not be sufficient enough to beat the disease infecting about 390 million people around the world every year, according to experts. “This vaccine is not a magic bullet. It has to be integrated with a holistic approach where community engagement its center alongside vector control”, Jean- Antoine Zinsou, Senior Director, Public Affairs and Advocacy at Sanofi- Pasteur, the vaccine manufacturer that developed the Dengvaxia. Dengue is the fastest growing mosquito-borne disease in the world, mainly due to increasing urbanization in tropical and sub-tropical climates where the Aedes aegypti, the mosquito that carries the dengue virus, lives. Due to the rapid spread of the virus, the World Health Organization accelerated its procedure for evaluating new vaccines and, last April, the Organization released a recommendation to adopt the vaccine and a definitive position paper is expected to be released on July 29. The Aedes aegypti depends on stagnant water to lay its eggs and reproduce. Natural water containers, like puddles, or artificial recipients, such as flower pots, forgotten buckets or even coconut shells, make ideal breeding grounds. “Community engagement is the key to successful dengue prevention and to get rid of the mosquito breeding sites”, explains Zinsou. 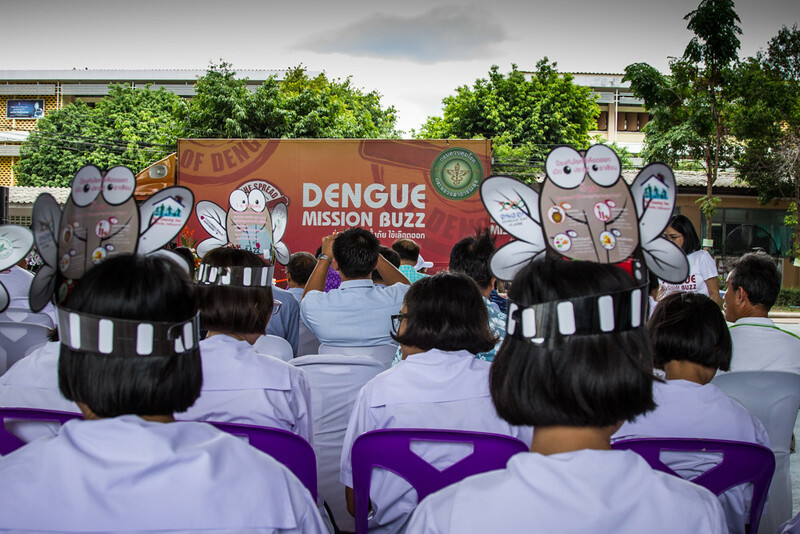 Southeast Asia, the region with the highest dengue incidence in the world, is well aware of the importance of communities in the fight against dengue and, six years ago, the Association of Southeast Asian Nations (ASEAN) launched the ASEAN Dengue Day. This information day is celebrated every June 15 to raise awareness about the risk of the disease. “Dengue prevention and control is a shared responsibility which needs collective action from all stakeholders to work together and enhance cooperation as one community “, says the Bangkok Call for Action released on the occasion of the 6th ASEAN Dengue Day, held under the theme, ‘Community Empowerment: A Sustainable Success to Fight Dengue’. For this approach to be effective, identifying the key actors in the communities is essential. “This is very context specific. Some may believe more in religious figures. For other, the village chief is more acceptable to them,” says Muhammad Shafique, Regional Behaviour Change Communication Specialist at the Malaria Consortium. One key ingredient that could improve dengue-vaccine effectiveness is community. Nevertheless, research shows that the most trusted figures are community healthcare workers (CHW). In India, for instance, CHW help to strengthen the immunization programs and reduce the burden of vaccine-preventable diseases, according to a study from the University of Pittsburgh. Experts also stress the indirect benefits that communities can get from vaccination since it reduces the odds of the mosquito biting an already infected person and transmitting the disease to a healthy individual. In the case of dengue, this indirect benefit is even more important because the vaccine is only approved for use in people nine to 45 years old. Implementing a vaccination program is usually not an easy task with many variables coming into play. According to a literature review carried out by researchers from Sanofi-Pasteur and Kingston University, the non-socio-demographic determinants to vaccination adoption can be organized into five main dimensions: access, or easiness to get the vaccine; affordability, or cost related to it; awareness of the existence of the vaccine and its benefits; acceptance of the vaccine; and activation or a motivation that brings people into the vaccination centers. Even when governments adopt the vaccine into their Expanded Programs on Immunization, such as The Philippines which launched the first public dengue vaccination program last March, communities are still key in breaking some of these barriers. “If we understand that in order for the vaccine to be effective, you need all three shots (six months apart), it is critical that the persons who start their vaccine complete all three,” said Indeok Oak, Independent consultant on development. “In order to facilitate this, the process of obtaining the vaccine shots must be readily accessible. Providing vaccine shots at schools, workplaces, or already existing facilitate where people go regularly would make it easier to get the shots rather than having to physically go to a designated clinic or hospitals.” These community places are also important in monitoring and implementing surveillance systems on the effectiveness of the vaccine in the communities where it has been administrated. Sharing these community-based experiences is also essential to build knowledge on how to fight the rapid spread of dengue. For this reason, Break Dengue has organized the €10,000 Prize, a competition that aims to find the best initiatives and campaigns that help to combat dengue fever by integrating the new vaccine into the anti-dengue arsenal. Join Dengue Track! Click the link below to report dengue near you. Bunmi Ngotleusay’s most valuable assets in her garden aren’t her car or the thick fruit trees, but the big jars containing hundreds of small fish. They are her main protection against the deadly dengue that used to ravage the village just a few years back. "Before we didn’t know where the mosquitoes live and how they reproduce. We didn’t know how to combat them," remembers Bunmi, who since 2005 has been the Chief of Ban Tat Thong, a small village close to Vientiane. In 2007, a big dengue outbreak led Bunmi to seek assistance from the Lao Ministry of Health, who found a big epidemic of the Aedes aegypti mosquito in the area. After Bunmi’s request, a local doctor donated some guppy fish to the village’s pagoda. This small, popular fish specie has proven to be an effective way to eradicate mosquito populations as they eat the larvae floating in water. A trial study conducted by the governments of Cambodia and the Lao People’s Democratic Republic (Lao PDR) between 2009 and 2011, with the support of the Asian Development Bank (ADB) and the World Health Organization (WHO), showed that the introduction of guppy fish in some communities have resulted in a sharp decline in mosquito larvae in water storage tanks and, consequently, in the number of mosquitoes in the area. Ban Tat Thong has been one of the pilot programs in Laos to use these small aquatic animals to fight mosquitoes. From the pagoda, the small fish spread around the village and, today, roughly 90% of the 300 households in Ban Tat Thong have their own anti-mosquito jars. "We haven’t had any cases of dengue in the village in the last 3 or 4 years," shares Bunmi. Kam Sengsavang’s daughter was close to death in 2005 after a mosquito bit her at school. "On the third day we sent her to the hospital because she was in shock," recalls Kam. She recovered after seven days at the hospital but the memories of high fever and muscle pain remain with her. "We heard about the fish and wanted to have them to protect ourselves. And ever since we have the fish here, we are not afraid anymore," shares Kam. Having guppies isn’t enough to ensure a dengue-free environment though. Avoiding any stagnant water where mosquito-larvae can grow is also crucial in guaranteeing the success of the program. And although vector management is important, it’s just one of the steps in eliminating dengue. "I try to always have everything clean and to empty any container where water can remain. We have to be very careful with [the leftovers of] the coconuts and make the shells face down," says Lee Vanh, a middle-aged mother of three who has a small shop in front of her house. "With dengue, there is only losing, there is no winning. If villagers are sick, they lose time and money because they cannot work," says Bunmi. "So we work very hard to fight against it." What are people in your community doing to fight dengue?